Denison joined Tidewater Community College in July as the program head for Music at the Norfolk Campus. Denison began teaching music as a high school band and choir director in Klamath Falls, Ore. Once he earned his master’s in conducting, he switched gears and taught choir and band to elementary school children in Tacoma, Wash.
Over the past decade, Denison’s work has taken him to six states, including a post at Treasure Valley Community College in Idaho and Oregon. “I found my niche in the community college because we have such a diverse student body. Some students are working toward associate degrees, while others just want to learn to sing or read music,” he said. 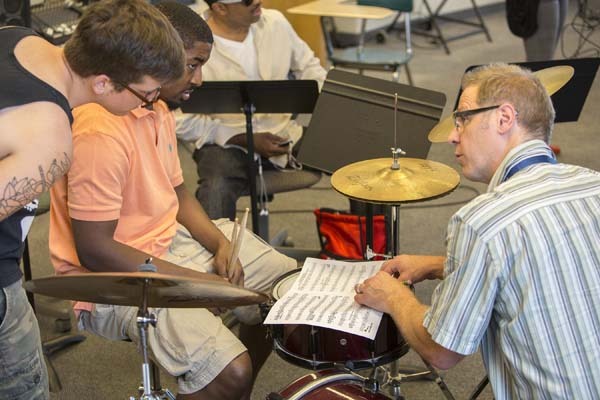 Professor Denison works on techniques with percussionists. Denison is excited about the potential for developing a stronger music program at TCC. Adding more student ensembles is among Denison’s first priorities. “We are a performance art, so I really want to get students out there performing with their instruments. We definitely learn by doing,” he said. Dension plays the trombone and all low brass instruments, as well as the trumpet and horn. He also plays upright and electric bass, jazz piano and sings. He dabbles in woodwinds and percussion. “When you’re a music educator, you pretty much play everything,” he said with a laugh. A family of performers, Denison and his wife Candie, a vocalist and actress, enjoy sharing the stage with their daughter. In his free time, Denison practices American Wing Chun Silat, as he holds a black belt in the art.